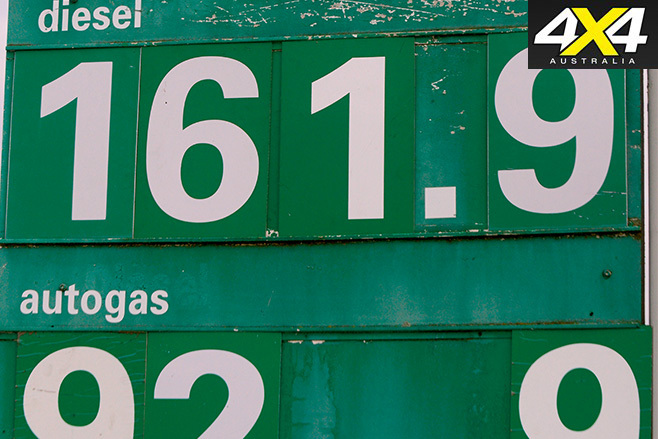 Fuel Comparison: Diesel, petrol or LPG? 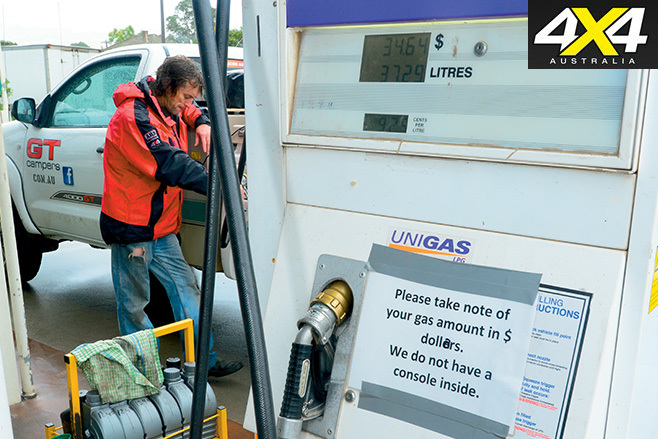 With the fuel debate raging, we take two 4x4s and crunch the numbers for diesel, petrol and LPG. 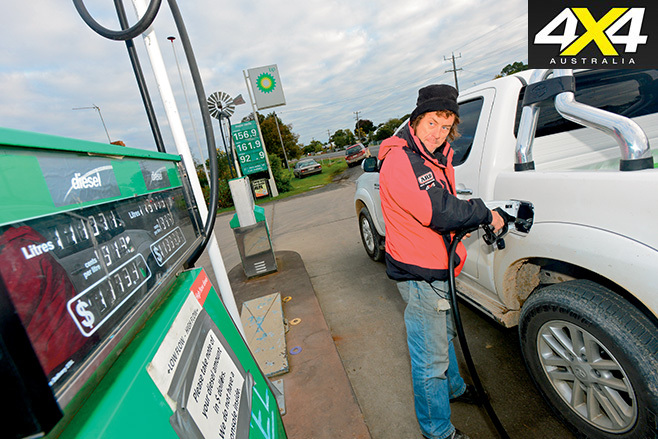 It’s been several years since 4X4 Australia compared fuel types. 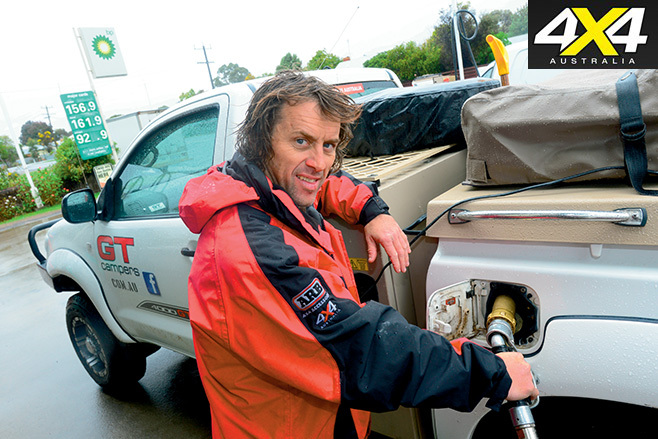 This article was originally published in the August 2014 issue of 4x4 Australia. 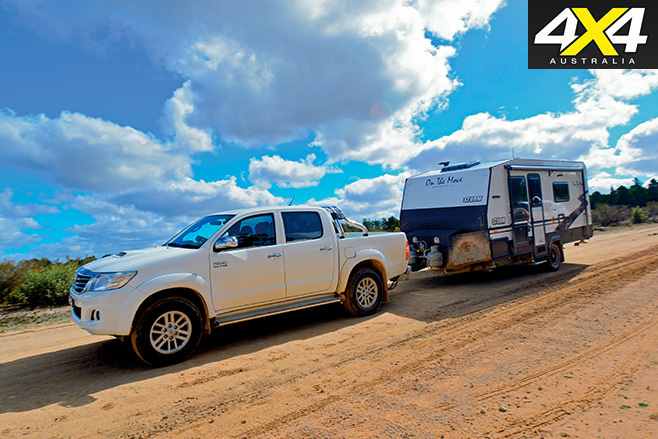 In fact, the last time we compared economy and costs was back in 2006, when fuel prices skyrocketed – we took diesel and petrol versions of the then-new and still-current Nissan Navara and Toyota Hilux for a comprehensive ’burbs, bush and beach bash all in the name of research. 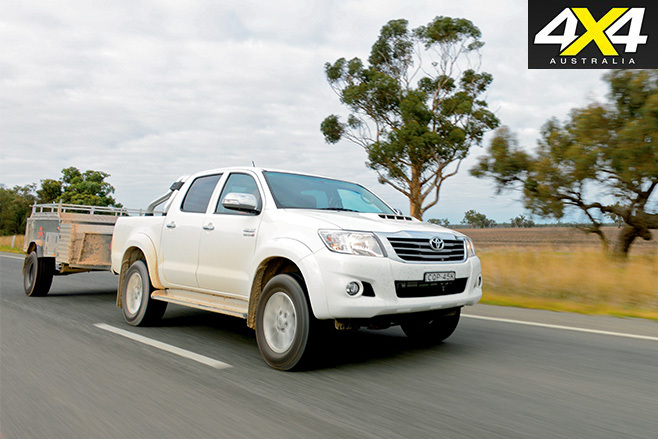 We needed vehicles to run the numbers and Toyota’s Hilux is a good choice. It’s available with 3.0-litre four-cylinder turbo-diesel engines and is one of the few commercial vehicles to continue offering buyers a grunty petrol option: a 4.0-litre quad-cam four-valve V6 petrol, but only on the top-spec SR5. Its popular diesel, the D-4D 3.0-litre, four-cylinder, four-valve turbo rattler develops 126kW at 3600rpm and 343Nm at 1400rpm. It ladles out strong performance lower in the rev range, making it a more confident and capable tow vehicle than some newer-design engines. It’s backed by a five-speed manual or a five-speed automatic (as shown here), new for Hilux and replacing the four-speeder of the previous model. Next to it, Toyota’s 4.0-litre DOHC four-valve all-alloy V6 develops a stout 175kW at 5200rpm and 376Nm at 3800rpm. Thanks to the tech tricks of variable cam timing and dual-runner intake manifold, the lusty V6 manages to fill-out the lower part of the torque curve far better than its ‘revvy’ specifications and smaller-than-V8 capacity suggest. It certainly doesn’t need much clutch-feathering to get moving. 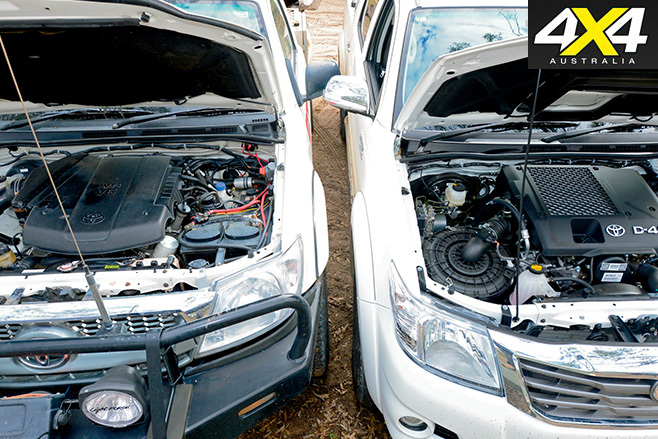 Petrol engines can be converted to run on cheaper, greener, liquefied petroleum gas (LPG) but this is not a showroom option on any 4x4 vehicle. 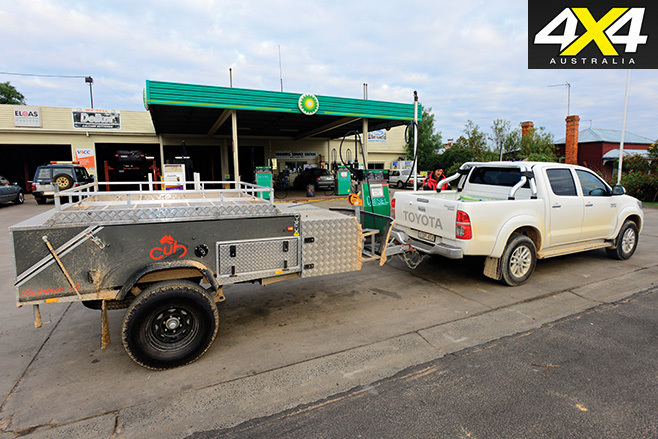 So for this task, we used a camper-equipped 2005 Hilux SR 4WD 4.0-litre petrol V6 fitted with an aftermarket Impco/BRG sequential vapour LPG injection system to provide dual-fuel operation. This LPG installation features one injector per cylinder and sequential injection, just like a standard petrol injection system. In fact, the Impco set-up has an engine-bay mounted electronic control unit to interface with the Toyota’s ECU; each LPG injector copies a petrol injector’s behaviour to provide precise LPG delivery and engine outputs and driveability that are identical to petrol. The engine is also protected by a Valvemaster system to prevent or reduce valve seat damage as LPG burns hotter and is more aggressive on the exhaust valves. Note that while Toyota (and other manufacturers) offer an LPG option on some models, this one is an aftermarket system and is not endorsed or warranted by Toyota. It’s possible to install LPG on a diesel vehicle, too, but the outcome is different to that on a petrol/LPG dual-fuel vehicle. 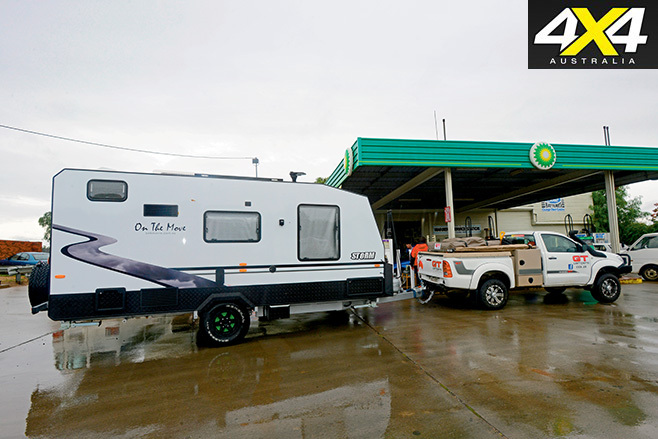 According to Diesel Gas Australia, introducing a small amount of LPG to a diesel-burning engine allows it to produce more power and torque with less diesel consumption. The LPG works as a catalyst, introduced by a single injector into the intake manifold at part-throttle and above (not at idle) to improve the burning of the diesel. It does not replace diesel completely, as LPG does in a petrol-powered engine. This better burn of the diesel thanks to the presence of LPG boosts torque and power. As the LPG is a ‘power adder’ fuel, its consumption in a diesel vehicle is a small proportion of the distillate burn. Of course, we couldn’t test this in our test loop, but more grunt and better economy is worth crunching the numbers for!